Ovarian cancer is cancer of the ovary. The most common type of ovarian cancer is epithelial ovarian cancer, there are other rarer types. 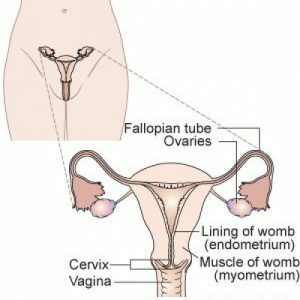 There are two ovaries, one on each side of the pelvis. The ovaries produce eggs and are the main source of the female hormones, oestrogen and progesterone. A woman’s menstrual cycle is usually about 28 days. Every month, at around the middle of the menstrual cycle, an egg is released from the ovary through the fallopian tube to the uterus. If this egg is not fertilised by sperm, the thickened lining of the womb is shed as a period at the end of the cycle. Then the whole cycle begins again. The ovaries are made up of millions of cells. Some of these cells make hormones, some surround the eggs as they develop, and others make up the outside layer of the ovary. Cancer develops when any one of these cells start to multiply out of control, forming a tumour. The information in this leaflet is about epithelial ovarian cancer, which accounts for nearly 9 out of 10 (90%) of cases of ovarian cancer. Epithelial means surface layer. So this is the cancer of the surface layer of the ovaries. If you have some of the symptoms listed and they persist for three or more weeks, take action. Because the ovaries lie hidden within the abdomen, ovarian cancer often goes unnoticed in the early stages. It is only at the advanced stage when the cancer has spread, or metastasized, that symptoms become quite clear. Most cases are only discovered when the disease has affected other pelvic and abdominal organs. Unlike cervical cancer or breast cancer, unfortunately there is no regular screening test for ovarian cancer. If you are concerned about ovarian cancer, particularly if you have a family history of the disease, you should consult your doctor. If you have had a BRCA test and it is positive, you may have the option of risk reducing surgery. This involves removing the ovaries and fallopian tubes. This also depends on your age, personal circumstances and family planning considerations. If you have already been to your doctor and the symptoms have got worse or have not gone away, it is important to go back again and get checked out. If you feel there is something wrong, tell your doctor. Be assertive. Your life may depend on it. Early detection is important. More women are surviving ovarian cancer. Finding cancer at an early stage gives a better chance of being treated successfully. Early diagnosis saves lives. Usually, you begin by seeing your GP who will ask you about your general health and gently feel your tummy (abdomen). You will be asked about any symptoms you have. Your GP may do an internal examination to see if your womb and ovaries feel normal and if your cervix looks normal. You can ask for a female doctor to do this if you prefer. This internal exam should take five minutes at most. Your GP may also take a blood sample, which can be sent away for testing for CA125, a protein that is produced by some ovarian cancers. If your doctor thinks it is necessary, he or she might also refer you for an for an ultrasound scan. This scan may show if the ovaries are the right size and looks normal in texture and if there are any cysts on the ovaries. Your doctor may also ask you to have a CT scan. This is a type of X-ray that takes pictures from different angles. The pictures are fed into a computer to form a detailed picture of the inside of your body. Your doctor will use the scan to get a detailed picture of the ovaries and surrounding areas. Currently, there is no screening programme for ovarian cancer because there is no screening test that is accurate and reliable enough to detect ovarian cancer in the general population. However, researchers are working on this all the time so it is possible that a screening test will be available in the future. If you are diagnosed with ovarian cancer, your doctors will assess what stage the cancer is at. This will help determine your treatment plan. The main treatments for ovarian cancer are surgery and chemotherapy. 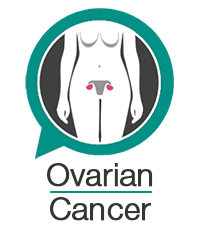 Download our free ovarian cancer information leaflet. If you have questions about ovarian cancer, please use our Ask the Nurse service. It is free and confidential. Click here to submit a question.